Have you ordered an Uber from Facebook Messenger? Have you used Amazon Echo’s Alexa to listen to tweets? Has Amy Ingram scheduled a meeting for you? Have you asked Siri for directions? If so, you, my friend, have had a close encounter with a bot. There’s a chatbot boom happening, if you haven’t noticed. Chatbots are the hottest thing in technology and are slowly making their way into your everyday life. Tens of thousands (if not hundreds of thousands) of chatbots have now been developed across many platforms. These chatbots are designed to make life a little easier. It’s not long until bots are there for your every need, likely before you even know the need exists. Why Are Chatbots So Hot? With advancements in technology, natural language processing, and artificial intelligence, chatbots are more useful today than ever before. They can understand and process more information and respond more intelligently. Not only have chatbots progressed, but the environments in which they live have evolved in their favor. According to Business Insider’s Intelligence report, mobile messaging apps have now surged past social media apps in popularity, meaning people prefer private messaging to posting on feeds. Consumers are overwhelmed by content. To reach consumers today, you need to have a fundamental understanding of who they are and what they care about most—their interests, passions, trusted news sources, thought leaders, etc. To engage consumers, you need to be where they are. Chatbots are a new way to do just that. The opportunity for brands to reach and engage their customers, providing value on a one-on-one basis at scale, is staggering. Building a conversational user experience from the ground up. Employing the smarts, through machine learning, to enable fruitful conversation. Having a long-term view where your brand becomes your ultimate brand ambassador and builds one-to-one customer relationships, at scale, over time. Just think about the user experience. Say you need a new pair of sneakers for an upcoming race. You could message your favorite shoe retailer, mention what you need the sneakers for, ask for top-rated shoes, and purchase them right there in your messenger app on your phone. You don’t even need to type the request; you might be talking to it. And that’s just the beginning. Bots will be able to share content with you on the items that you are thinking about purchasing, compare items for you, recommend related products, let you know when a product goes on sale . . . and that’s just retail. The possibilities are truly endless. The convenience of shopping, handling customer service issues, or whatever else the chatbot will do will drive brand engagement. It’s the ultimate shopping experience and encourages quicker buying decisions. Not only will this top-notch experience ignite people to talk about your brand, but it will also build customer loyalty. Now are you excited about chatbots? If you couldn’t tell, I sure am! Chatbots are a relatively new subject to marketing, so there isn’t a single known source of expert advice and information. 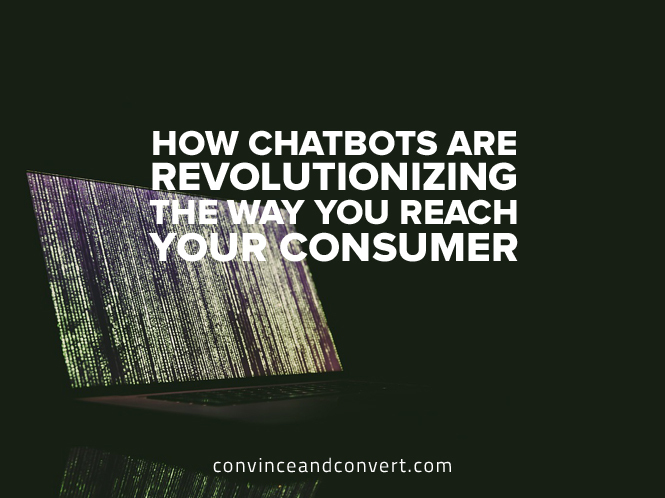 As a marketer, I wanted to learn what the chatbot revolution means for me and how I can stay up to date on everything “chatbot.” Here’s what I found. Who Are the Early Chatbot Adopters, and What Are They Saying? To learn more about the chatbot boom, I ran an interest-based segmentation analysis using Affinio (full disclosure, I’m part of the Affinio team and genuinely interested in chatbots!). This allows us to understand the conversation around chatbots in the context of the individuals’ interests and passions. We can see how each segment is discussing chatbots and figure out why they are important to them. The following is the audience visualization of anyone talking about chatbots on Twitter in the United States during a 30-day period starting September 17, 2016. To create this visualization, the Affinio algorithm identified any individual mentioning “Chatbot” over the 30-day period. There were 5,839 people. It then looked at the hundreds of thousands of connections of the audience members and what they choose to follow, and it grouped individuals with common interests. 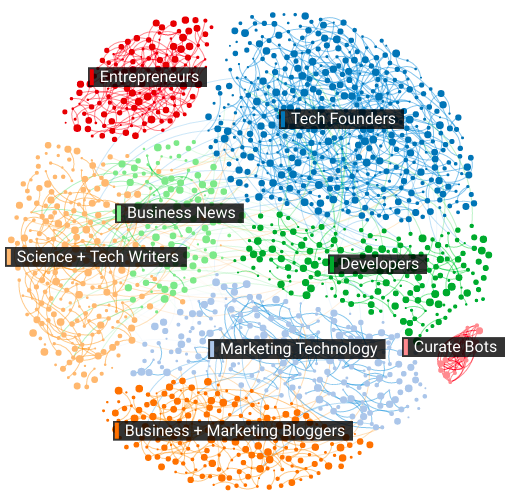 Above, you can see the interest-based clusters that are talking about chatbots. There’s even a cluster of bots themselves—bots talking about bots! The majority of people talking about them are the innovators, Technology Founders, Marketing Technology, and Developers. Let’s learn more about these communities and what they find interesting about chatbots. To give you a sense of who these people are, the above image shows how they self-describe in their bio, the top-used hashtags over the thirty day period, and the most important accounts to them. 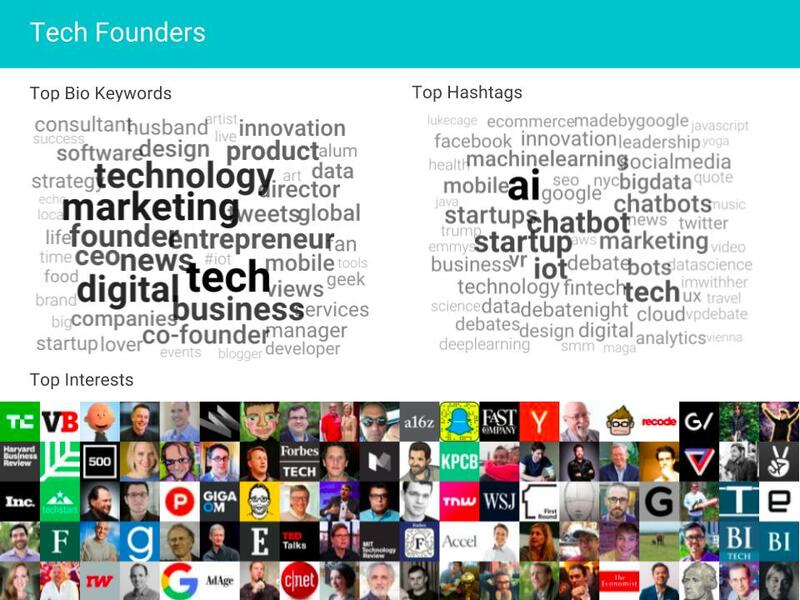 Their interests include tech news sources, top VCs, and tech thoughtleaders. These are the people leading the charge: the technologists who are inventing the next thing coming. 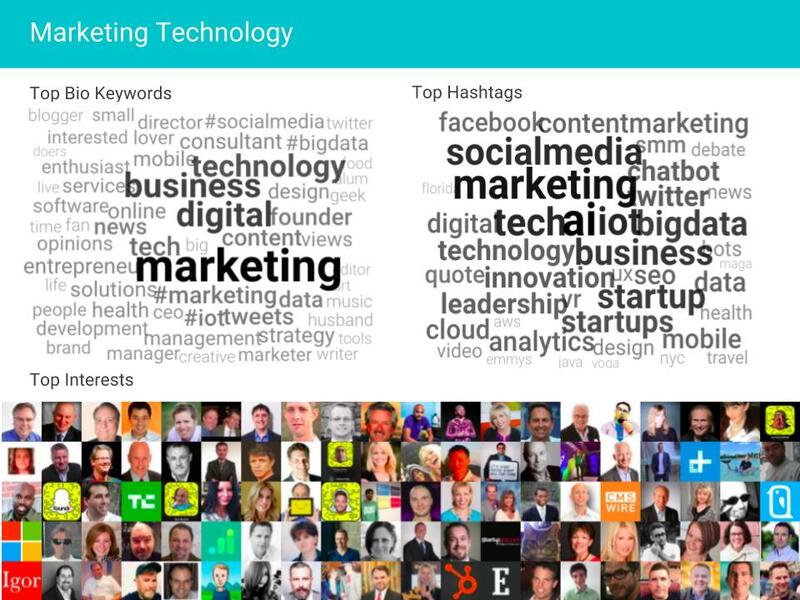 As you can see, the Marketing Technology crowd is quite different from the Tech Founders crowd as far as how they self-describe and their interests, but their topics of conversation are similar. These people look to marketing technology thought leaders like Evan Kirstel, Matt Heinz, and Warren Whitlock for information. While they are marketers, their interests lie in new advances coming down the pipe like AI, Internet of Things, and Big Data. What are the Marketers talking about when it comes to #Chatbots? 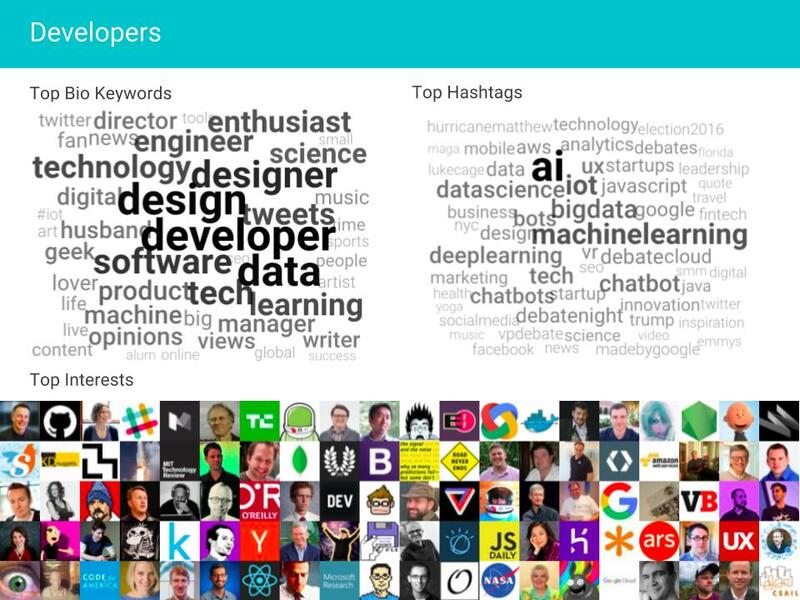 Looking at the developers community, we can see they’re discussing chatbots in a very different light compared to the Tech Founders or Marketing Technology crowds. These are the people that make the bots (and if you read that again in a whisper, it’s really creepy . . .). As we can see in the content above, there’s still a lot of questions to be answered. Instead of a slew of best practice content, the thoughtleaders in chatbots are still sharing developments and announcements in changes in the industry. This is an indication that the chatbot revolution is still in its infancy—there is still so much to come. To keep up-to-date on changes in the chatbot revolution, keep an eye on the top media sources that these early adopter communities look to for information—sources like TechCrunch, VentureBeat, and Recode. And be sure to follow thought leaders like Walt Mossberg, Travis Wright, and Hilary Mason. Do you think chatbots will revolutionize the way you reach and engage your consumers? I’d love to hear your thoughts. Let me know in the comments below! This post is part of a paid sponsorship between Affinio and Convince & Convert. Get more content like this, plus the very BEST marketing education, totally free. Get our Definitive email newsletter. India White is a freelance content strategist passionate about driving content innovation through a deep knowledge of audiences and data-driven strategies. Always excited to hear about new ideas and collaboration, don't hesitate to reach out to discuss. We work to double your digital and we've done that for some of the best companies in the world. Find out how we have helped organizations from higher education to entertainment, non-profit and Fortune 1000 brands. Are you throwing gas on your own fire? Too often, we use the wrong words when interacting with customers. Our short eBook spotlights the phrases your customers hate, and how to change them.